Ruthiebear (Titusville, NJ, United States) on 24 September 2015 in Plant & Nature. A couple of weeks ago I went on a photo workshop to an abandoned Game Farm in Catskill, NY. In his day, well maintained, and possibly with flowers and fish .. today .. life, semi-wild life remains in it. Precioso paisaje, con maravillosos colores e iluminación... Buen día. De très belles couleurs vives!! Oups, du travail en vu... c'est cool ce parc abandonné... Bise et bon jeudi! with beautiful frame, lights & textures! 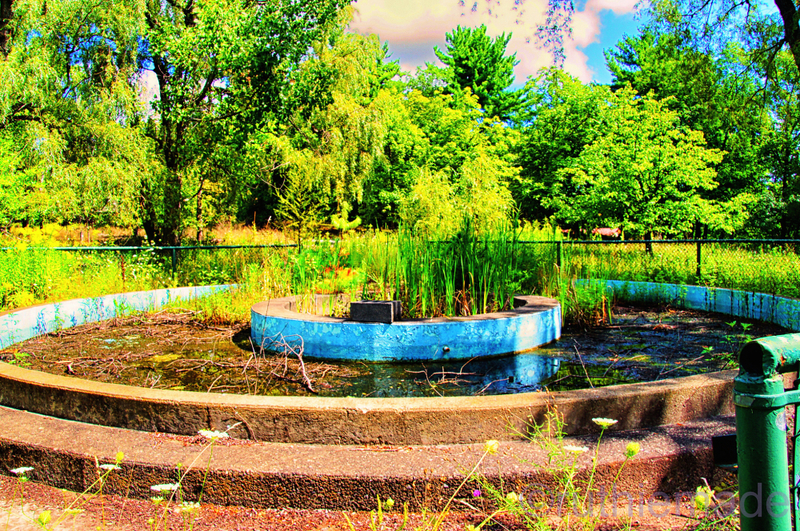 It's sad to see a fountain reduced to the state of decay. Nature retakes the places we make if we give up tending to them. Et oui, l'herbe pousse continuellement! très beaux contrastes! Your bold colors brighten up an otherwise bleak environment. Perhaps there is a treasure of coins hiding beneath. Wow...Bright colors ! Superb composition. I am sure that would look great if cleaned up. A pond/fountain in sore need of maintenance. Nice, but somewhat garish image of it. Beautiful colors! It brings life to the old fountain! A lovely image! Beautiful light, nice green. excellent frame.